Most quality Pond Suppliers like others that carry Aquascape water treatments are dedicated to providing their customers with the most comprehensive and logical pond maintenance programs available. 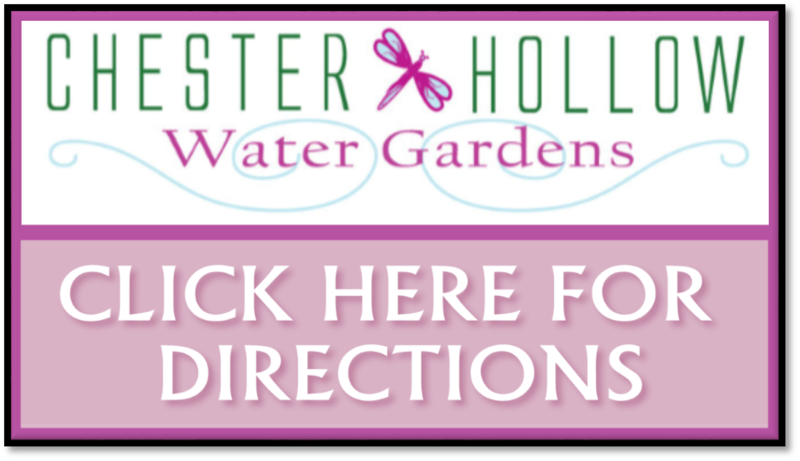 This dedication enables us at Chester Hollow Water Gardens to make educated improvements on our product line and maintenance techniques thus allowing us to offer the most comprehensive and highest quality pond advice & services that you will find in your area. Simply put we love Ponds and Waterfalls and enjoy the opportunity to share our knowledge and expertise with you so that you may enjoy your Water Gardening lifestyle. We recommend you research the water treatments any retailer is proposing to you and ask if the products are environmentally friendly and proven to work for your pond. ​Eliminate the guesswork and routine of adding water treatments to your pond, Pondless® Waterfall, fountain, or water feature. In order for water treatments to work correctly, or to maintain optimum water quality, water treatments should be added consistently and on a regular basis. The Aquascape Automatic Dosing System accurately and consistently applies your choice of water treatment. 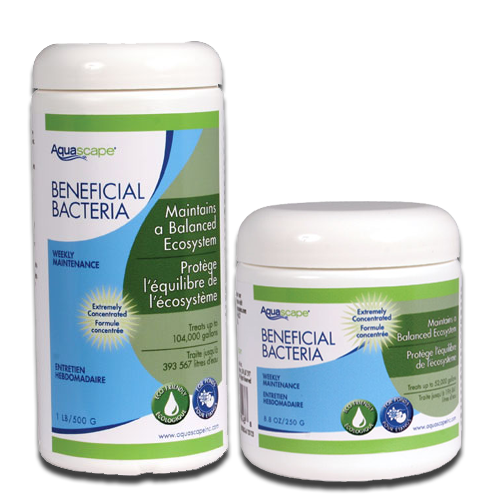 Aquascape Beneficial Bacteria contains 8 pure strains of concentrated beneficial bacteria, including PSB bacteria and enzymes. 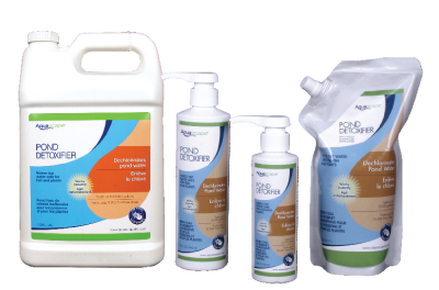 This combination of natural cleaners helps to maintain a strong biological balance in your pond. Because ornamental water gardens are enclosed ecosystems, sometimes factors like fish load, uneaten fish food, organics such as leaves, sludge and unwanted debris may disrupt the balance. Aquascape Beneficial Bacteria maintains a strong biological balance; providing clean, clear and healthy water conditions. PSB (Photo Synthetic Bacteria) help quickly clear pond water by clumping fine debris and allowing it to settle. ​250ml/8.5 oz, 500ml/16.9 oz, 1 liter/33.8 oz,4 liters/1 gal. Rapid Clear is a great way to increase the efficiency of existing mechanical filtration. The convenient pump bottle makes for quick, easy and accurate dosing. Bottle treats up to 5,000 gallons. One pump per 100 gallons. Aquascape Rapid Clear is scientifically blended to quickly clear cloudy or discolored pond water fast. 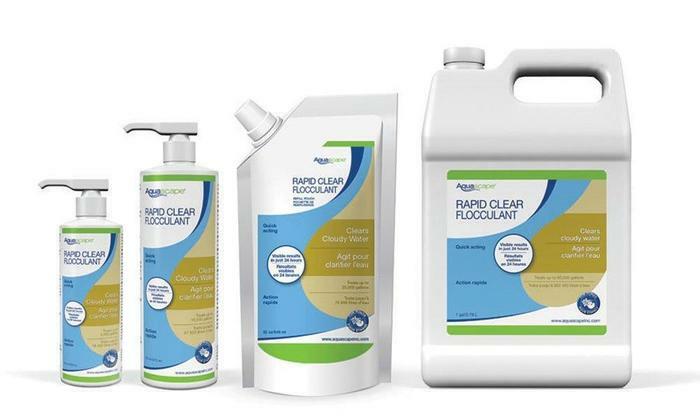 Rapid Clear goes to work clumping suspended debris, also referred to as flocculation. Most ponds will be crystal clear within 24 hrs.